Browse: Home / Who Authorized Preparations for War with China? The United States is preparing for a war with China, a momentous decision that so far has failed to receive a thorough review from elected officials, namely the White House and Congress. This important change in the United States’ posture toward China has largely been driven by the Pentagon. There have been other occasions in which the Pentagon has framed key strategic decisions so as to elicit the preferred response from the Commander in Chief and elected representatives. A recent case in point was when the Pentagon led President Obama to order a high level surge in Afghanistan in 2009, against the advice of the Vice President and the U.S. ambassador to Afghanistan. The decision at hand stands out even more prominently because (a) the change in military posture may well lead to an arms race with China, which could culminate in a nuclear war; and (b) the economic condition of the United States requires a reduction in military spending, not a new arms race. The start of a new term, and with it the appointment of new secretaries of State and Defense, provide an opportunity to review the United States’ China strategy and the military’s role in it. This review is particularly important before the new preparations for war move from an operational concept to a militarization program that includes ordering high-cost weapons systems and forced restructuring. History shows that once these thresholds are crossed, it is exceedingly difficult to change course. In the following pages I first outline recent developments in the Pentagon’s approach to dealing with the rise of China; I then focus on the deliberations of the highest civilian authorities. These two sides seemed to operate in parallel universes, at least until November 2011 when the pivot to Asia was announced by the White House—though we shall see their paths hardly converged even after that date. I conclude with an outline of what the much-needed civilian review ought to cover. I write about the “Pentagon” and the “highest civilian authori­ties” (or our political representatives) rather than contrast the view of the military and that of the civilian authorities, because the Pentagon includes civilians, who actively partici­pated in developing the plans under discussion. It is of course fully legitimate for the Pentagon to identify and prepare for new threats. The question that this article raises is whether the next level of government, which reviews such threats while taking into account the input of the intelligence com­munity and other agencies (especially the State Department), has adequately fulfilled its duties. Have the White House and Congress properly reviewed the Pentagon’s approach—and found its threat assessment of China convincing and ap­proved the chosen response? And if not, what are the United States’ overarching short- and long-term political strategies for dealing with an economically and militarily rising China? Since the Second World War the United States has maintained a power-projection military, built upon forward deployed forces with uninhibited access to the global commons—air, sea, and space. For over six decades the maritime security of the Western Pacific has been underwritten by the unrivaled naval and air power of the United States. Starting in the early 1990s, however, Chinese investments in sophisticated, but low-cost, weapons—including anti-ship missiles, short- and medium-range ballistic missiles, cruise missiles, stealth submarines, and cyber and space arms—began to challenge the military superiority of the United States, especially in China’s littoral waters. These “asymmetric arms” threaten two key elements of the United States’ force projection strategy: its fixed bases (such as those in Japan and Guam) and aircraft carriers. Often referred to as anti-access/anti-denial capabilities (A2/AD), these Chinese arms are viewed by some in the Pentagon as raising the human and economic cost of the United States’ military role in the region to prohibitive levels. To demonstrate what this new environment means for regional security, military officials point out that, in 1996, when China conducted a series of missile tests and military exercises in the Strait of Taiwan, the United States responded by sending two aircraft carriers to the South China Sea, a credible display of force that reminded all parties of its commitment to maintaining the status quo in the region.1 However, these analysts point out, if in the near future China decided to forcefully integrate Taiwan, the same U.S. aircraft carriers that are said to have once deterred Chinese aggression could be denied access to the sea by PLA anti-ship missiles. Thus, the U.S.’s interests in the region, to the extent that they are undergirded by superior military force, are increasingly vulnerable. With Marshall’s guidance, Secretary of Defense Robert Gates instructed the Chiefs of Staff to begin work on the AirSea Battle (ASB) project and, in September of 2009, Air Force Chief of Staff Gen. Norton Schwartz and Chief of Naval Operations Adm. Gary Roughead signed a classified Memorandum of Agreement endorsing the plan.3 ASB received Gates’ official imprimatur in the 2010 Quadrennial Defense Review which directed the U.S. military to “develop a joint air-sea battle concept . . . [to] address how air and naval forces will integrate capabilities across all operational domains—air, sea, land, space, and cyberspace—to counter growing challenges to U.S. freedom of action.”4 In late 2011 Gates’ successor, Secretary of Defense Leon Panetta, also signed off on the ASB and formed the new Multi-Service Office to Advance AirSea Battle. Thus, ASB was conceived, born, and began to grow. AirSea Battle is already beginning to shape acquisition decisions. General Schwartz writes that, “The first steps to implement Air-Sea Battle are already underway here at the Pentagon. In our FY 2012 and FY 2013 budgets we increased investment in the systems and capabilities we need to defeat access threats.” 13 Admiral Greenert points to the investments in anti-submarine warfare, electronic warfare, air and missile de­fense, and information sharing, that were included in the President’s 2012 budget as one aspect of ASB’s implementation and notes that the 2013 budget “sustains these investments and really provides more resilient C4ISR [Command, Control, Commu­nications, Computers, Intelligence, Surveillance and Reconnaissance] investments.”14 The New York Times reported that the new Littoral Combat Ship (LCS), which is able to deftly navigate shallow coastal seas, is “central to President Obama’s strategy of projecting American power in the Pacific.”15 So far, two of the planned fifty-five LCSs have been completed, and the first will be deployed in Singapore in 2013. A press report in August 2012 stated that “the Air-Sea Battle concept has prompted Navy officials to make significant shifts in the service’s FY2014-FY2018 budget plan, including new investments in ASW, electronic attack and electronic warfare, cyber warfare, the F-35 Joint Strike Fighter (JSF), the P-8A maritime patrol aircraft, and the Broad Area Maritime Surveillance (BAMS) UAV [Unmanned Aerial Vehicle].”16 Some point out that many of these weapons would have been ordered even if there was no ASB, and that some purchases merely constitute technology updates. However, it is also true that a smaller defense budget means making choices about the allocation of resources, and evidence suggests that the Pentagon has made the hardware of ASB a high priority. Some argue that ASB is merely a limited ‘operational concept.’ However, insofar as it is influencing the Pentagon’s ‘hardware’ purchases and is transforming force structure, ASB is moving beyond its conceptual stage. Moreover, even if it is merely a highly influential concept, it still merits high-level review. Indeed, as far as one can determine, the Pentagon decided to embrace the ASB concept over alternative ways for sustaining U.S. military power in the region that are far less likely to lead to escalation. One such is the “war-at-sea” option, a strategy proposed by Jeffrey Kline and Wayne Hughes of the Naval Postgraduate School, which would deny China use of the sea within the first island chain (which stretches from Japan to Taiwan and through the Philippines) by means of a distant blockade, the use of submarine and flotilla attacks at sea, and the positioning of expeditionary forces to hold at-risk islands in the South China Sea. By foregoing a mainland attack, the authors argue that the war-at-sea strategy gives “opportunities for negotiation in which both sides can back away from escalation to a long-lasting, economically disastrous war involving full mobilization and commitment to some kind of decisive victory.”22 In the same vein, the “Offshore Control Strategy” put forward by National Defense University’s T. X. Hammes, “seeks to use a war of economic attrition to bring about a stalemate and cessation of conflict” by establishing a distant blockade and a maritime exclusion zone within the first island chain, while dominating the sur­rounding waters “to ensure the continued flow of trade to our allies while tightening the blockade against China.”23 This would not bring a decisive victory, but would allow the United States to achieve its objectives of protecting its allies and maintaining free access to sea lanes, while giving China space to back down. As I see it, the implied strategy is clear: ASB planners aim to make the United States so clearly powerful that not only would China lose if it engaged militarily, but it would not consider engaging because the United States would be sure to win. Krepinevich holds that ASB achieves both deterrence through denial, “designed to convince a would-be aggressor that he cannot achieve his objective, so there is no point in trying,” as well as deterrence through punishing, “designed to persuade him that even though he may be able to achieve his objective, he will suffer so much as a result that his anticipated costs will outweigh his gains.”30 The imagined result of ASB is the ability to end a conflict with China in much the same way the United States ended WWII: The U.S. military defeats China and dictates the surrender terms. This military strategy, which involves threatening to defeat China as a military power, is a long cry from containment or any other strategies that were seriously considered in the context of confronting the USSR after it acquired nuclear arms. The essence of the Cold War was mutual deterrence, and the conflict was structured around red lines that not only the Warsaw Pact forces were not to cross (e.g., by moving into the NATO controlled areas) but that the NATO forces were also committed to respect by not crossing into the Soviet realm that included Eastern Europe and East Germany. (This is the reason the United States did not help the freedom fighters who rose against the Communist regimes in Hungary and Czechoslovakia.) First strike (nuclear) strategies were foresworn and steps were taken to avoid a war precipitated by miscommunications, accidents, or miscalculations. In contrast, ASB requires that the United States be able to take the war to the mainland with the goal of defeating China, which quite likely would require striking first. Such a strategy is nothing short of a hegemonic intervention. When Andrew Krepinevich suggested that ASB is simply seeking to maintain stability in the Asia-Pacific, he was asked if this “stability” really meant continued U.S. hegemony in the area. He chuckled and responded, “well, the nations in the area have a choice: either we are number one or China [is]—and they prefer us.”31 Actually, most of the nations in the area prefer playing the big powers against each other rather than joining a particular camp. They greatly benefit from trade and investment from China and, at the same time, most are quite keen to receive security backing from the United States. And they realize that in a case of conflict between the United States and China, they stand to lose a great deal. (A common saying in the area: “When the elephant and tiger rumble, the grass gets trampled.”) Most important, one must ask if there are other strategies that do not operate on the assumption that our dealings with China represent a zero-sum game. For instance, one should consider if there are strategies in which the superpower pursues its interests by accommodating a rising power—especially when this power is mainly a regional one—by allowing it an increased sphere of influence. This is the way Britain, once a superpower that relied greatly on naval power, accommodated a rising upstart—the United States. To judge by several published reports which will be discussed in greater detail below, including those by government “insiders,” there is no indication—not a passing hint— that the White House has ever considered earnestly preparing the nation for a war with China. Nor is there any evidence that the White House has compared such a strategy to alternatives, and—having concluded that the hegemonic intervention implied by ASB is the course the United States should follow—then instructed the Pentagon to prepare for such a military showdown. Indeed, as far as one can determine at this stage, the White House and State Department have engaged in largely ad hoc debates over particular tactical maneuvers, never giving much attention to the development of a clear underlying China strategy. True, some individuals in the State Department and White House pursued engagement and cooperation, and others advocated ‘tougher’ moves that seem to reflect a vague preference for containment. However, neither approach was embraced as an overarching strategy. The November 2011 presidential announcement that the United States was beginning a “pivot” from the Near to the Far East may at first seem to suggest that a coherent stance on China had coalesced within the administration. We will see shortly that this is not the case. A third book covering the same era, Bending History: Barack Obama’s Foreign Policy, confirms with much nuance what the other two books report. It discusses the White House ‘toughening,’ its reaction to what were viewed by many as assertive moves by the Chinese, such as its aggressive action in the South China Sea in 2010, and President Hu Jintao’s refusal to condemn North Korea’s torpedo attack on a South Korean warship.37 Here again, it is reported that the White House and State Department reacted by chang­ing the tone of the speeches. For instance, in a thinly veiled criticism of China, Obama stated in 2011 that “prosperity without freedom is just another form of poverty.”38 The administration also intensified the United States’ participation in ASEAN and the East Asia Summit (EAS) and encouraged—but only indirectly and cautiously—countries in the region to deal with China on a multilateral rather than bilateral basis in resolving territorial disputes. The Obama administration also ramped up U.S. participation in the Trans-Pacific Partnership negotiations, a free trade agreement that at least initially would exclude China, and is thought by many to be a counterbalance to China’s ex­tensive bilateral trade relationships in the region. Furthermore, the president paid of­ficial visits to both Burma and Cambodia—two nations that have distanced themselves from China in recent years. All these are typical diplomatic moves, some of which have economic implications, but not part of a preparation of the kinds of confrontational relationship ASB presumes. In his book Confront and Conceal, David E. Sanger confirms what these three accounts suggest: the Obama administration never formulated a coherent, consistent, proactive China strategy and its policies were primarily reactive.39 And, this well-placed source also lacks any mention of a review of AirSea Battle and the military strategy it implies. In the public sphere there was no debate—led by either think tanks or public intel­lectuals—like that which is ongoing over whether or not to use the military option against Iran’s nuclear program, or the debate surrounding the 2009 surge of troops in Afghanistan. ASB did receive a modicum of critical examination from a small number of military analysts. However, most observers who can spell the ins-and-outs of using drones or bombing Iran—have no position on ASB or its implications for U.S.-China relations and the world order, simply because they do not know about it. A December 11, 2012 search of Google brings up 15,800,000 hits for “U.S. drone strikes”; a search for “AirSea Battle”: less than 200,000. In Googlish, this amounts to being unknown, and suggests this significant military shift is simply not on the wider public’s radar. In November 2011, President Obama announced that, with the wars in the Middle East coming to a close, his national security team was to make the U.S. “presence and mission in the Asia-Pacific a top priority.”42 At first blush it might seem that this dramatic change in strategic focus was very much in line with the one the Pentagon has been developing intensely since 2008. In reality, this rebalancing can be interpreted in several ways—none of which support the conclusion that the pivot amounted to an endorsement of ASB. One possible view of the pivot is that it was very much in line with the President’s long-standing view—one he expressed even before he was elected—that Asia, as the heart of the global economy, was of growing importance to the United States. Hence, as he was freeing the United States from its engagement in Iraq and from Afghanistan, the time had come to shift priorities. Moreover, immediately after declaring the Asia-Pacific a top priority, Obama assured that “reductions in U.S. defense spending will not—I repeat, will not—come at the expense of the Asia-Pacific . . . we will allocate the resources necessary to maintain our strong military presence in this region.”43 At the same time, the United States secured an agreement with Australia which provided for the rotation of 2,500 Marines through the northern port city of Darwin and announced that 60 percent of the Navy would be positioned in the Pacific by 2020—up from 50 percent moves highlighting that there were indeed a few military accouterments to the pivot. Critics attacked this take on the pivot from two vantage points. Some saw it as hollow, “all hat and no cattle” as one Texan military officer put it in a private conversation with the author. Sending some 2,500 Marines adds little to overall U.S. forces in the area, which already amount to some 320,000 troops. Some of those Marines are actually being moved away from Okinawa to Australia—some 2,600 miles from China. The re-berthing of a few ships does not display a significant power shift. All the rest of the pivot was—to parrot a criticism often raised against Obama—eloquent talk with little follow-through. Others see the pivot as merely political maneuvering during an intense election campaign, undertaken to fend off the GOP’s repeated charge that the Democrats are soft on defense. The Obama administration removed U.S. troops from Iraq, but the unstable Iraqi regime—tilting toward Iran and refusing to allow the United States to keep bases in Iraq—made it difficult to present the withdrawal as a victory. The great difficulties the administration encountered in Afghanistan and Pakistan also did not make for a compelling election picture either. Furthermore, the Arab Awakening was looking more and more like a loss for the United States at least in the short run. Nations that used to be reliable allies, in particular Egypt, were (and continue to be) in a state of disarray, and the turmoil in Syria presented the war-weary United States with only poor options. In this context, shifting attention from the Near to the Far East, in which the United States could throw its weight around—at least in the short term—was a safe bet, as long as it involved only a few new outlays and mainly the repositioning of assets already in hand let alone the implementation of the AirSea Battle concept. Moreover, in November 2012 during the only presidential election debate dedicated to foreign policy, no reference was made to preparations for a war with China. Governor Romney repeatedly stated that he was going to be tougher on China than President Obama by declaring it a currency manipulator on his first day in office—a hard line stance but one focused exclusively on economic matters. President Obama cited the increased trade sanctions bought against China by his administration and said that his “pivot” policy sent a “very clear signal” to China that the United States is and will remain a Pacific power.44 But no more. In short, however one interprets the “pivot” to Asia, it clearly does not constitute an endorsement, let alone the implementation of the AirSea Battle concept, and the strategy it implies. I am not arguing that the U.S. military is seeking out war or intentionally usurping the role of the highest civilian authorities. Information about the rise of China as an economic and military power is open to a range of interpretations. And the Pentagon is discharging its duties when it identifies new threats and suggests ways to respond to them. Moreover, civilians—including two Secretaries of Defense—have endorsed ASB and arguably the strategy it implies. But while ASB should not be dismissed on the grounds that it is merely an attempt to secure a mission and funds for the military, there is room to question whether the threats have been overstated and to ask if the Pentagon-favored response is the right strategy. The time has come for the White House and Congress to reassess both the threat and the suggested response. It is up to the serious media, think tanks, public intellectuals and leaders of social political movements to urge for such a comprehensive review, and to counter the gradual slide toward war that the Pentagon is effecting—even if its intention may well be to promote peace through strength. – Daniel Tam Claiborne served as Lead Editor for this article. *Amitai Etzioni is University Professor and Professor of International Affairs at The George Washington University. He is the author of Hot Spots: American Foreign Policy in a Post-Human Rights World, Security First, and From Empire to Community. He has served as a Senior Advisor to the White House and as President of the American Sociological Association. He has taught at Columbia, Harvard and Berkeley. 3 Kyle D. Christensen, “Strategic Developments In The Western Pacific: Anti-Access/Area Denial And The Airsea Battle Concept,” Journal of Military and Strategic Studies, vol. 14, no. 3 (2012), 10. 4 U.S. Department of Defense, Quadrennial Defense Review Report (Washington DC: Government Printing Office, February 2010), 32. 6 Jan Van Tol et al., AirSea Battle: A Point-Departure Operational Concept, (Washington, DC: Center for Strategic and International Studies, 2010), 66. 7 Van Tol et al., AirSea Battle, 34. 8 Hugh White, The China Choice: Why America Should Share Power (Melbourne: Black Inc., 2012), 78. 10 Van Tol et al., AirSea Battle, 90–91. 11 Todd Harrison, Analysis of the FY 2013 Defense Budget and Sequestration (Washington, DC: Center for Strategic and International Studies, 2012), 4. 16 O’Rourke, “China Naval Modernization,” 92. 18 U.S. Department of Defense, “Background Briefing on Air-Sea Battle by Defense Officials from the Pentagon,” (news brief) November 9, 2011, transcript available at http://www.defense.gov/transcripts/transcript.aspx?transcriptid=4923. 22 Jeffrey Kline and Wayne Hughes, “Between Peace and Air-Sea Battle: A War at Sea Strategy,” Naval War College Review, vol. 65, no. 4 (2012), 36. 28 T. X. Hammes, “Offshore Control: A Proposed Strategy for an Unlikely Conflict,” Strategic Forum No. 258 (National Defense University Institute for National and Strategic Studies, 2012), 2. 29 Dan Blumenthal, “The US Response to China’s Military Modernization,” in Strategic Asia 2012-13: China’s Military Challenge, ed. Ashley Tellis and Travis Tanner (Washington, DC: The National Bureau of Asian Research, 2013). 31 Andrew F. Krepinevich, interview with author, December 3, 2012. 32 Jeffrey A. Bader, Obama and China’s Rise: An Insider’s Account of America’s Asia Strategy (Washington, DC: The Brookings Institution, 2012), 7. 33 Bader, Obama and China’s Rise, 3. 34 Bader, Obama and China’s Rise, 147–150. 35 James Mann, The Obamians: The Struggle Inside the White House to Redefine American Power (New York: Penguin Group, 2012), 245. 36 Andrew F. Krepinevich, interview with author, December 3, 2012. 37 Martin S. Indyk, Bending History: Barack Obama’s Foreign Policy (Wasingtonton, DC, The Brookings Institution, 2012), 38–41. 39 David E. Sanger, Confront and Conceal: Obama’s Secret Wars and Surprising Use of American Power (New York: Random House, 2012). 45 For more discussion, see Amitai Etzioni, “Accommodating China,” Survival, vol. 55, no. 2 (2013). 46 For more discussion, see Amitai Etzioni, Hot Spots: American Foreign Policy in a Post-Human Rights World (New Brunswick, NJ: Transaction Publishers, 2012). Bader, Jeffrey, A. Obama and China’s Rise: An Insider’s Account of America’s Asia Strategy. Washington, DC: The Brookings Institution, 2012. Blumenthal, Dan. “The US Response to China’s Military Modernization.” Strategic Asia 2012–13: China’s Military Challenge (2013). Etzioni, Amitai. Hot Spots: American Foreign Policy in a Post-Human Rights World. New Brunswick, NJ: Transaction Publishers, 2012. Greenert, Jonathan. 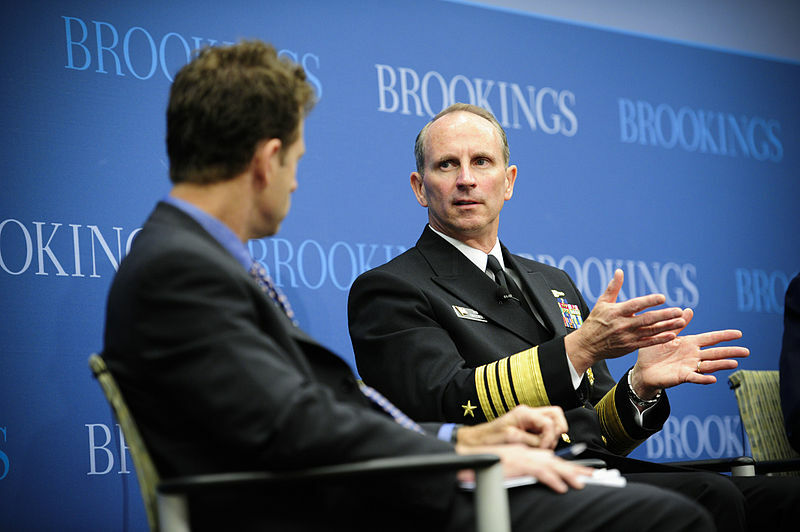 “Air-Sea Battle Doctrine: A Discussion with the Chief of Staff of the Air Force and Chief of Naval Operations,” lecture presented at The Brookings Institution, May 16, 2012. Hammes, T.X. “Offshore Control: A Proposed Strategy for an Unlikely Conflict.” Strategic Forum, No. 258 (2012): 2. Harrison, Todd. “Analysis of the FY 2013 Defense Budget and Sequestration.” Washington, DC: Center for Strategic and International Studies, (2012). Indyk, Martin S. Bending History: Barack Obama’s Foreign Policy. Washington, DC : The Brookings Institution, 2012. Jan Van Tol et al., AirSea Battle: A Point-Departure Operational Concept. Washington, DC: Center for Strategic and International Studies, 2010. Kline, Jeffrey , Hughes, Wayne. “Between Peace and Air-Sea Battle: A War at Sea Strategy.” Naval War College Review, vol. 65, no. 4 (2012): 36. Mann, James. The Obamians: The Struggle Inside the White House to Redefine American Power. New York: Penguin Group, 2012. U.S. Department of Defense, Quadrennial Defense Review Report, (2010). U.S. Department of Defense. “Background Briefing on Air-Sea Battle by Defense Officials from the Pentagon.” http://www. defense.gov/transcripts/transcript.aspx?transcriptid=4923 (2011).